About eight years ago, a young man handed me (father) an article in a Christian magazine dedicated to world evangelization. One paragraph in particular caught my eye. The author suggested that any family choosing to take their children to “dangerous” out of the way places for the sake of Kingdom witness might be guilty of sacrificing their children to Molech. After all, why take children to difficult locations when we can reach internationals in major Western cities? And this was in a magazine dedicated to reaching the nations for Christ! At the time I was living in such a “dangerous” place. Apparently, I was also offering my four children to Molech. The funny thing is, during a decade of living in such a place, three of those children made credible professions of faith in Jesus Christ. To this day they are growing spiritually and embracing Kingdom values. Our family made sacrifices of a sort, but not to Molech! Our Heavenly Father has taken good care of those children (and still does not matter where we locate as a family). For various reasons, few families today choose to go overseas, and the leaders of these families (the fathers) will often say that “the family” is what keeps them from doing so. They regard their families as burdens in missions work rather than as valuable assets, so they hesitate to commit to full-time cross-cultural disciple-making. Meanwhile, the single man or woman is treated as the prime candidates because he or she is unhampered and available. Singlehood is indeed a good time to pursue missions without the added cares of family. But having a family should not prevent overseas work. When it does, the family may have become an idol. In Matthew 28, Jesus commands all of his followersto make disciples of all nations. This command applies to whole families as well as to unattached singles. Families professing to follow Christ should be Kingdom families—families focused on the spread of the gospel to all nations. Different families will play different roles in the kingdom, but almost no family should shrink from the possibility of overseas ministry. Disciple-making is not limited to single men or women. 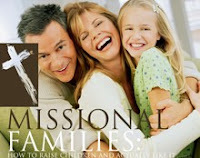 Families are extremely important in missions. Each member of the family has a responsibility in his or her role: women disciple women, men disciple men, parents train their children, children honor the Lord through obedience to their parents (Eph. 5, 6; Titus 2). When a whole family goes overseas, it offers a team of witnesses that can have a wide impact and that can present an incomplete but effective example (or analogy) of what it means to be the body of Christ. A single family is usually not the local church, but the Puritans were right to say a family can be “a kind of little church” in the home. In pioneer settings, this little church of the household can initially be a helpful model for first-generation followers of Jesus. In a sense, Christian families that go overseas take with them the DNA of a disciple-making, reproducible church. In restricted access countries, Christian families make disciples of local husbands and wives and their extended families. These new disciples become a “starter” church within the Christian family’s household, and this household starter church is the family’s center for worship, prayer, and teaching of the Word. Throughout the process, the kingdom family acts as an example for new believers. Whole families overseas also assimilate single workers, enabling younger, single Christians to be more acceptable and effective witnesses. This is particularly important in Muslim cultures that value families highly and do not understand singleness. Further, it’s typically heads of households that can reach other heads of households in most foreign contexts. The Bible offers examples of families who labor together to seek first God’s kingdom. Abraham left his country and his people, moving with his entire family to an unknown land. He went in faith, trusting God with whatever lay ahead. God had promised that all peoples on earth would be blessed through Abraham: “I will bless those who bless you, and whoever curses you I will curse; and all peoples on earth will be blessed through you” (Gen. 12:3). It was this kind of eternal perspective that compelled Abraham to leave everything familiar and embark on a journey to a foreign land. Abraham’s journey demonstrated faith. He trusted God enough to go wherever God called, whatever the cost. Of course, God was faithful to Abraham, making his descendants into a great nation through whom all peoples were eventually blessed by the Savior, Jesus Christ. Sometimes, Christian families can be hesitant to go overseas. Biblically, parents should take the training of their children very seriously. But couples often idolize their children, focusing on worldly success and accomplishments for their children, rather than on disciple-making. Abraham’s story demonstrates what a Kingdom attitude should be toward the blessing of children. In Genesis 12:3, God blesses Abraham so that he might be a blessing; prospering him with children and a good name—not for Abraham’s personal benefit or his children’s worldly success, but so that Abraham and his offspring could bless all peoples on earth. Overseas work may seem like too much of a risk to take with children, but God’s blessing of us with families should motivate us to look for ways to make those families a blessing to others. This is true in well developed nations as well; even Christian families in countries like the United States should strive to build families and raise children that will be a blessing to the nations. Children are not the only reason families hesitate to become cross cultural witnesses overseas. Couples may be unwilling to give up careers, their beloved church family, or the ease and comfort of life in the West. These blessings become distractions, keeping families from having Kingdom perspectives and faith in God. Overseas work can also seem frightening. Families may be paralyzed by the idea of moving away from extended family, retirement plans, and medical care. They might be afraid of new languages, new cultures, cooking from scratch, learning to use public transportation with a stroller in tote, and trans-ocean flights. These are understandable concerns, and some fears may remain long-term battles. In a fallen world, families will always have to deal with some fears no matter where they live. Nonetheless, these fears should not keep families from kingdom work, lest we be like Jonah. Like Abraham, instead, families can trust God’s protection and faithfulness with the unknowns. The West and America in particular is a comfortable and familiar place to live. It’s easy to think about what we might lose by moving to an out-of-the-way place. But we should also consider what might be worth losing for the sake of advancing the Kingdom among previously unreached people groups. Western preoccupations with stuff, techno-possessions, and the latest fashions can be just as dangerous—if not more—than the unknowns or lack of creature comforts of a foreign culture. Many Christian families would benefit greatly from giving up cable TV, ubiquitous entertainment, a preoccupation with comfort and convenience, the dizzying (spiritually numbing?) pace of life, and a centeredness on just one culture and language. Children could easily do without power toys, video games, year round extra-curricular sports, junk food, and the teen Hollywood or Nashville (Contemporary Christian Music) obsession. In fact, those of us with Christian families might grow closer together and stronger in character by distancing ourselves from the corrosive influences of American culture, preparing our families to be an even greater blessing to the nations. All Christian families should commit to be a blessing to the nations. Now, we’re not saying that all Christian families should leave the West for the overseas mission field. Disciple-making needs to happen all over the world, at home as well as abroad. Families that go need support from strong churches at home. For that reason, even before asking whether your family should stay or go, it may be worth asking whether or not you have a Kingdom perspective at all. Do you? HOW SHOULD YOU MAKE YOUR DECISION? Jesus’ charge in Matthew 28 calls all followers—even families—to make disciples. Nonparticipation is not an option. It is impossible to be followers of Jesus and understand the Bible but not participate in the spread of the gospel. The Bible is about God’s plan for the nations! Families should work to push aside their worries and go. As they become willing to go, churches should be willing to send out their best families for the sake of the Kingdom. They can also send out singles in tandem with families for working together on teams overseas. Again, the kingdom of heaven is like a merchant looking for fine pearls. When he found one of great value, he went away and sold everything he had and bought it(Matt. 13:44-46). Another disciple said to him, “Lord, first let me go and bury my father.” But Jesus told him, “Follow me, and let the dead bury their own dead” (Matt. 8:20-22). Pray, plan, and train your family/children to be a blessing to the nations. Make this one of your family goals/missions! Use Operation World with your children; there is even a children’s version. Consider taking a short term trip as a family! Embrace the major story line of the gospel—God’s plan to bring glory to himself by redeeming a people from all the peoples of the world for himself. As a family, schedule weekly or monthly ministry opportunities to internationals in your metro area. Pray about whether God might be calling you to move your family to a different place so that you can be a blessing to peoples who have no access to the gospel. You might consider going for a year or two, or for five years, or for ten to fifteen years! Ask God to strengthen your Kingdom perspective and to show you how your family might increasingly be more fruitful in blessing others among the nations. Ask him to make you willing to do whatever he asks your family, wherever he asks you to do it, whatever the cost.